Stitching adds texture, dimension and a wonderful tactile quality to art pieces. 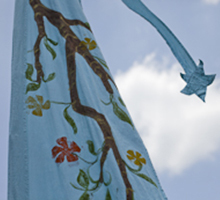 In this class students will begin by making 2-D pieces with photos, books pages, found papers, fabric and stitching. Students will then learn one or two non-adhesive bindings with exposed sewing on the spine that can be decorated with stitching on the cover as well. Once the skills have been learned the class will start combining the decorated pages and the bindings – resulting in one-of-kind artists’ books or a small series or edition. The result is a rich personal narrative with stitcherly depth and dimension. 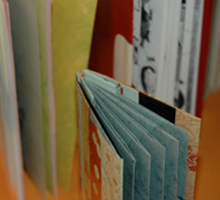 This class is for beginning students that are just starting to explore mixed media and bookmaking as well as advance students who want to learn to combine new media. 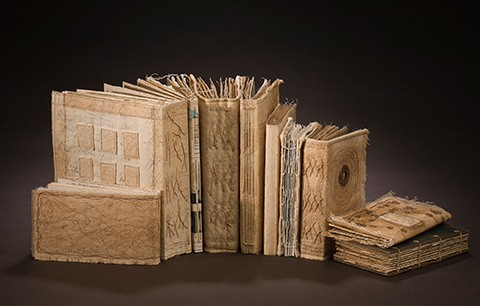 Jody Alexander is an artist, bookbinder, librarian, and teacher who lives and works in Santa Cruz, California. She has taught book arts at San Francisco Center for the Book, The Center for the Book in New York City, and University of California, Santa Cruz. Her work appears in a number of publications including Masters: Book Arts: Major Works by Leading Artist, 500 Handmade Books, and 1000 Artists' Books: Exploring the Book as Art. Jody has recently started Wishi Washi Studio at the Tannery Arts Center, in Santa Cruz, CA, where she and guest instructors teach bookmaking, paper, and fiber arts workshops. My interest as a bookbinder lies in using found and discarded papers and fabric in a number of historical and modern binding styles. I combine these books with found objects to create sculptural works. My pieces celebrate collecting, storytelling, and odd characters. I also like to rescue discarded books and give them new life as scrolls, wall pieces, and sculptural objects. My characters, books, sculptural pieces, and found items are occasionally combined to create installations.